I was wondering how much my Arduino I/O pin can output when it is set at Output and is at High. I am using an Arduino Uno R3. The Arduino UNO Digital IO pins are connected directly to the IO pins on the ATMEGA328P processor. 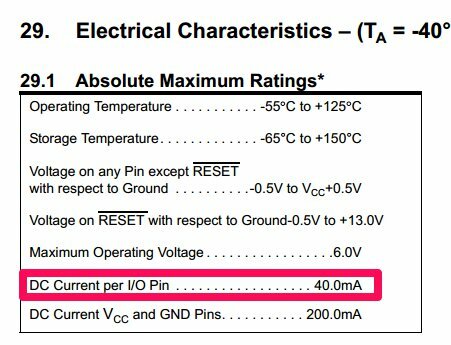 Note that there is also a total current limit for all output pins combined, and that the voltage starts to drop as the current goes up. Not the answer you're looking for? Browse other questions tagged current input or ask your own question. Can an arduino tell between being powered by USB or by the jack?